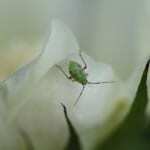 Now through the end of July is the critical time to manage infestations of plant bugs and stink bugs. 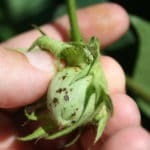 Of course it varies considerably, but we are seeing more consistent infestations of plant bugs. Stink bugs have made a come back after very low populations last year. Clouded plant bugs are also a bigger part of the mix this year in some areas. I prefer the drop cloth during this time frame, using a threshold of 3 tarnished plant bugs on a drop cloth as the treatment threshold. 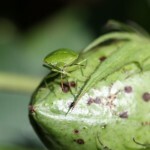 As a rule of thumb, count stink bugs as equivalent to 3 tarnished plant bugs and clouded plant bugs as equivalent to 1.5 tarnished plant bugs when making treatment decisions. Treatment options are limited. Diamond will not control adults and Transform has only moderate activity on stink bugs, so you need to rotate or tank mix when stink bugs are also present in significant numbers. Acephate/Orthene and Bidrin can be mixed with a reduced rate of Transform (e.g., 1 oz/acre) to shore up stink bug control. You can do something similar with Diamond, where you should tank mix Acephate of Bidrin. For example, Transform at 1 oz plus 0.5 lb acephate or 4 oz Bidrin has provided excellent plant bug and stink bug control in my tests. As the season progresses, pyrethroid insecticide can also be put in the mix in to help control stink bugs. Alternatively consider spraying Transform now at a typical rate (1.5 oz/acre) and then following with full a rate of Orthene, Bidrin, or the tank mixes with Transform (mentioned above) or a pyrethroid as needed. The point is to work in 2-3 different modes of action that maintain good control of both plant bugs and stink bugs. Bollworms may complicate the picture towards the end of the month … hence blog post #2.